The English poet John Donne once wrote, “No man is an island entire of itself”. This assertion has never faced a more literal challenge however than through the story of Haney Ameer. Mr Ameer lives on the outskirts of Mas-ha just outside of Qalqiliya in the West Bank. Back in 2003 his house was situated on the path of the proposed separation barrier, 80% of which is built on Palestinian land. When he refused to leave his house and his land the Israeli government decided to build the barrier around him. 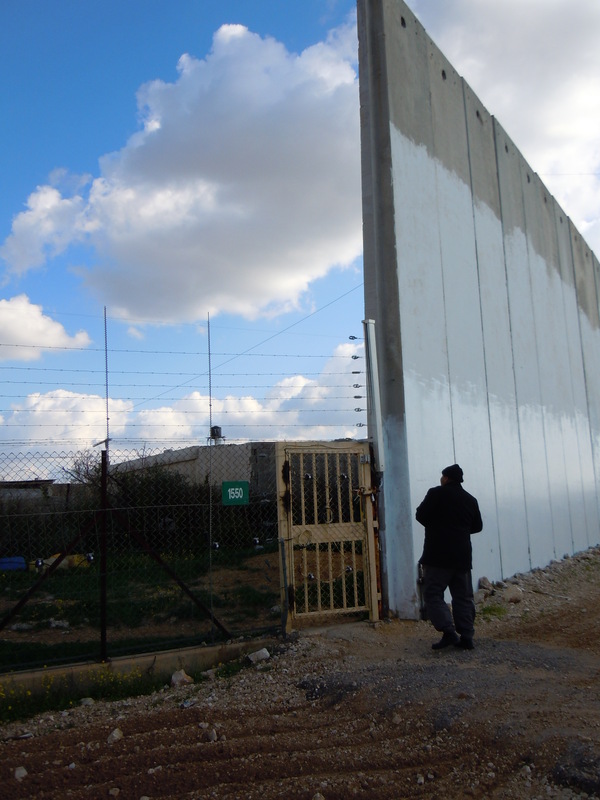 His house is now surrounded on all four sides by either walls, fences or the separation barrier. He lives in what looks like a high security prison except he now holds the keys for the one small gate that provides access to his property. On one side of his house is the 8 meter high concrete separation barrier that scars the landscape for as far as the eye can see. All over the wall there is battle between local graffiti artists and the Israeli Defence Force’s (IDF) censoring white paint. On the other side of his house there is an illegal Israeli settlement which is cut off from him by a barbed wire fence. Flanking each end of his property are locked security gates leading to the military road that track the separation barrier. He is hemmed into his small plot of land on all sides. On the approach to his house our driver and translator rings ahead for him to come and meet us. We pull up alongside the 8 meter high concrete slabs to walk the last few meters. Next to the barrier there is a small rusted metal door from where Mr Ameer emerges. Between 2003 and 2006 he lived in his property not owning these keys to access his own property. For three years he relied on the IDF to let him through the security gate each day to return to his own property. It was not uncommon in those days for friends to throw food parcels over the wall so he could feed his wife and children. We sit outside his broken and bruised property in the fading evening sun. He explains he cannot fix any of the broken windows, crumbling walls or holes in the roof as he cannot get a permit off the Israelis to ‘build’ on his own land. I ask him if he ever considered leaving. 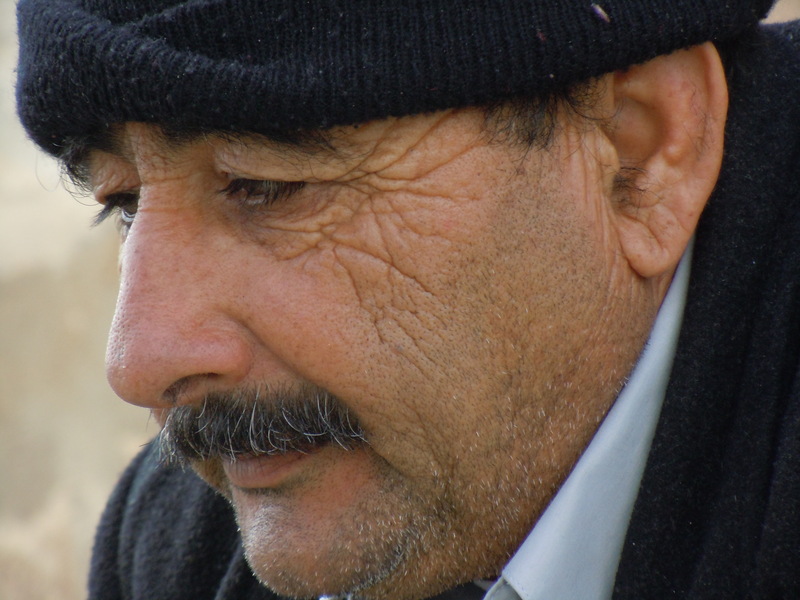 He responds with a story of isolation and incredible courage which is characterised by a lack of options. The Israelis offered him a lot of money and a chance to rebuild a bigger and better house on more land wherever he wanted in return for his land. He refused. Why he refused is a mixture of a connection to a family home that has been with him for years, and a slightly more harsh reality. The Palestinians who lived nearby warned him that if he sold up to the Israelis he would no longer be considered a ‘Palestinian’, he would be isolated. An ironic threat given his circumstances. Regardless of his motives, Mr Ameer now finds himself in a physical limbo, not on either side of the separation barrier. He insists that if he could turn back the clock then he would do nothing differently. I ask what he hopes for the future and he bleakly responds, “nothing, I will die like this”. This response sends a shiver down my spine as I realise that this is quite possible. The occupation has come to a point where a family can be living in 60 by 40 meter virtual quarantine and the world does not bat an eyelid. Mr Ameer has the look of a man who has told his story a million times before. He sits back in his chair as if this is a day to day occurrence for people all around the world as he recalls the details of his isolation. I wonder whether this is just his way of dealing with what is an unimaginable daily infringement on his personal liberty. The meeting comes to a close and he walks us back to the rusted metal gate. Unlocking the padlock he looks up at the separation barrier and then at the floor. His body forgets what he is doing for a brief moment but his hands are still unlocking the door they have unlocked everyday for the last 6 years. We leave him on the other side of the barrier. I cannot decide whether I have extreme admiration for this man, or if I just want to shake him by the scruff of the neck and tell him to move with his family to a new house. I suspect if I did the latter, he would sit me down, light a cigarette and tell me to not be so impatient. I am impatient though, I don’t want to think of this man sitting in his house, his virtual prison, until the day dies. There has to be an alternative ending to this tragic story. The occupation restricts peoples movement, freedoms and lives on a day to day basis. 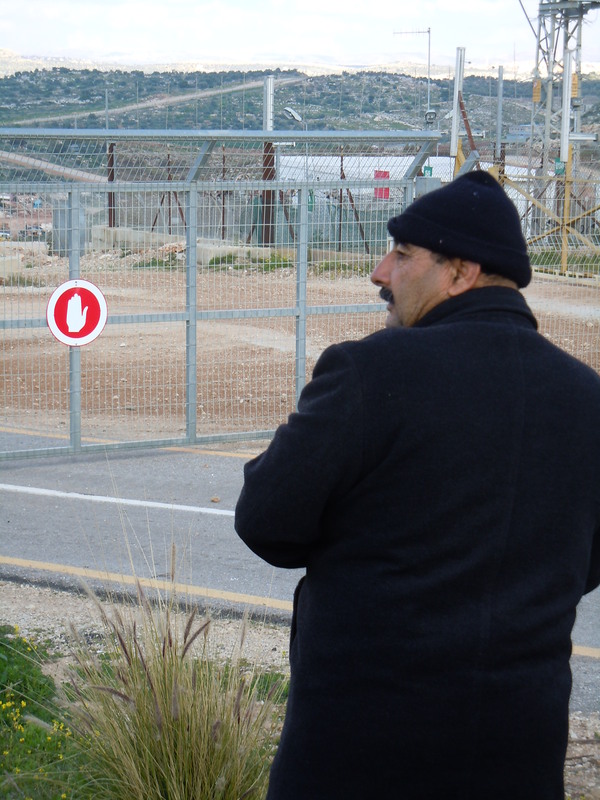 Mr Ammer’s story is unique only because of his physical proximity to the separation barrier. Haney Ameer will sleep tonight though knowing no one can tell him to leave his family house, not the IDF and certainly not a foreign human rights monitor like myself.